Located in Pudong, this hotel is within 6 mi (10 km) of Huaxia Culture Park, Wu Changshuo Memorial Hall, and Shanghai Sanjia Port Coastal Tourist Areas. Shanghai Disneyland© and Sanjiagang Beach Park are also within 9 mi (15 km). Along with tour/ticket assistance, this hotel has a front-desk safe and free WiFi in public areas. All 63 rooms provide free WiFi, coffee makers, and cable TV. Phones, desks, and free toiletries are among the other amenities that guests will find. Jingyue 99 Hotel - Jiangzhen features tour/ticket assistance, a safe deposit box at the front desk, and an elevator (lift). Wireless Internet access is complimentary. 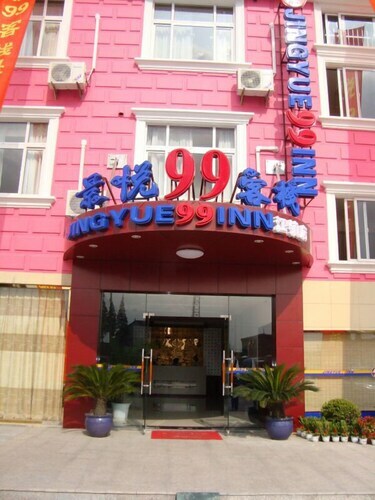 Jingyue 99 Hotel - Jiangzhen has designated areas for smoking.